Purpose:To prohibit the entry of all vehicles with a mass exceeding 3 500 kg, or vehicles, which have more than 10 seats, except for local access or delivery. • To yield right of way to pedestrians in the street. 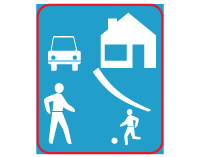 Action: Drive slowly, obey the special rules mentioned above and be particularly on the look out for children playing in the street.